This weekend our family made a trip over to Vancouver and like every month when we venture into the city now, we took a detour by Costco. With a giant jar of peanut butter and a ridiculously huge bag of chocolate chips, it just made sense to make some cookies with them. I'm usually a little skeptical of peanut butter cookies, mostly because they are often dry and I like mine to be a little more moist. 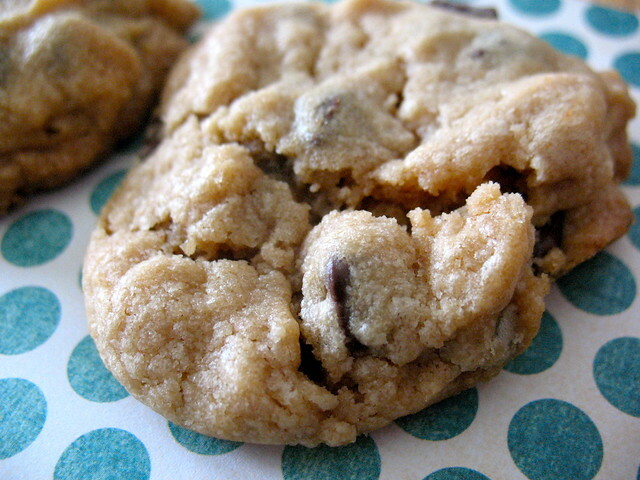 This recipe is a keeper because the cookies are still fairly soft and more moist than I had expected. Make sure to watch them carefully and not overbake, and have your butter just softened so it's easy enough to blend, but not really room temperature soft. Be sure to let the cookies sit on the cookie sheet a little once you remove them from the oven, because they are quite fragile and will break if you don't. However, I discovered that broken cookies only meant that they were fair game to eat and we all know that broken cookies have no calories, right? Pre-heat oven to 350 F. Line baking sheets with parchment paper. Using an electric mixer, cream together the butter and sugars until light and fluffy. Scrape down the sides of the bowl, then add the egg and vanilla and beat until well combined. In a separate bowl, stir together the flour, baking powder, and salt. Add to the butter mixture and stir together on low until just combined. Stir in chocolate chips. Drop the batter by level tablespoons onto the parchment paper lined sheet. Bake for about 10 minutes, until the cookies are just set on top and golden on the edges. Let the cookies cool on the sheets for a few minutes before removing to a cooling rack.